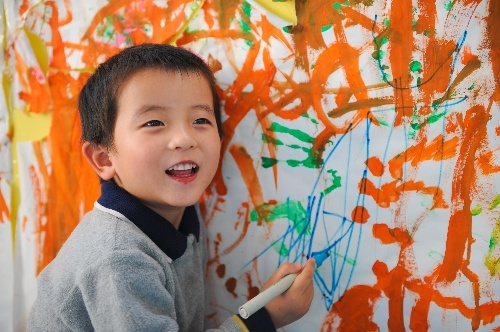 Wen Yongyan draws a picture at a child welfare facility in Guiyang, Southwestern China’s Guizhou Province, where he was settled after being rescued from child trafficking, waiting for his parents to be found. China’s Adoption Law came into effect in 1992 and was amended in 1999. The 34-article law plays a significant role in regulating adoption activities and protecting lawful adoptive relationships. Enthusiasm for adoption in the aftermath of the Wenchuan earthquake in 2008 and news stories about the challenges of resettling children rescued from trafficking prompted public reflection on the nation’s adoption law. In particular, the adoption law became outdated after China enacted the new universal two-child policy. New top-level design is urgently required to reform the concrete adoption system in China. The adoption law specifies the requirements and procedures for adoption by distinguishing different subjects and circumstances. However, the law takes into consideration too many factors and has a vague value orientation. The design of the concrete requirements is also complicated and sets a high threshold for adoption. One consequence of this high threshold is the waste of adoption resources. More than 600 children lost both their parents in the Wenchuan earthquake and more than 80,000 applied to adopt these orphans. However, in the end, only 12 were successfully adopted. This waste of adoption resources can be blamed on the strict regulations on the adopter, adoptee and guardians who intend to place children up for adoption. A successful adoption must satisfy all the regulations. Hence, the rate of successful adoption is very low. Then there are cases where a child is put up for adoption while their parents are still alive. Adopting these children requires their natural parents to relinquish their guardianship. The law states this can only happen when a child is legally given up or illegally abandoned and their parents cannot be found. However, many infants and children who are rescued from trafficking and whose parents cannot be found do not meet this requirement for adoption. They are neither legally given up nor illegally abandoned, which means they are stuck in social service institutions waiting for their parents. They cannot be adopted through lawful adoption procedures. Another consequence is that authorities find it difficult to rein in unlicensed adoption. In order to stem the excess of unlicensed adoptions, the law was amended in 1999 to lower the minimum age requirement for adopters from 35 to 30 and make adoption registration procedure uniform. Take the Yuan Lihai incident in Henan Province in 2013 for example. Yuan Lihai adopted more than homeless 100 children over a period of 20 years. The accidental fire at her unlicensed orphanage fueled public reflection on the lack of supervision over unlicensed adoption. According to the Ministry of Civil Affairs, more than half a million orphans are raised by relatives, other guardians or non-government institutions. The number of unlicensed adoptions is large. In unlicensed adoptions, the legal relationships are unclear, responsibilities are not well defined and there is a lack of official regulation. China’s adoption law is a product of its time. It reflects the comprehensive implementation of the nation’s former one-child policy. For example, article three said that adoption shall not contravene laws and regulations on family planning. The law also states that generally the adopter should be childless and may adopt one child only. According to the law, people who have put a child up for adoption may not bear any more children or else they would violate the regulations on family planning. The general articles of the law still conform to the nation’s family planning policy today. However, detailed articles that reference the one-child policy may be amended now that China has implemented a universal two-child policy. When handling the relationship between the adoption system and family planning policy, the adoption should be treated as independent to avoid conflicting legal principles. For example, in the case of a remarried couple, if the husband or the wife has adult children, can they adopt another minor child? The adoption law requires the adopters to be childless. However, on the one hand, according to the regulations on family planning, the remarried couple is allowed to bear another child. In the worst-case scenario, they are not allowed to have a natural child of their own because they do not meet certain requirements. In both cases, if the remarried couple has both the capability and the willingness to adopt an orphan, it would be reasonable for the law to support and encourage this adoption. All these shortcomings imply that the adoption system should be reformed. Most importantly, concepts of the adoption system should be adjusted. Drafted in the 1990s, the adoption law was meant to regulate adoption activities and protect the rights of all parties. The law also designed to prevent attempts to illegally circumvent the family planning policy through adoption and combat child trafficking. Although these illegal activities have not been eradicated, the ethnographical structure, economic situation, social attitudes and national governing pattern of China have drastically changed. Based on the practical needs of future social life, the revisions to the adoption law should value the role of adoption in social governance. Adoption not only affects the adoptive family, but also helps to unite the individuals into family units. These people are either childless or parentless. They are deprived of family life or lack support from family members. By incorporating lonely individuals into a family, the relationship and integration of intergenerational groups can also be improved, contributing to the harmony and stability of society as a whole. The modern adoption legal system benefits from the breakdown of the division between public and private law. According to the Ministry of Civil Affairs, by the end of 2015, China had about half a million orphans, of which about 20 percent were being housed in mass facilities. The rest live scattered across the nation. And 85 percent of the handicapped orphans live in rural areas. This indicates public welfare facilities are incapable of supporting orphans and satisfying the needs of handicapped orphans for nutrition, rehabilitation and medical care. The high standards for adoption and insufficient regulation on unlicensed adoption also pose a challenge for protecting adoptees’ rights. As the situation changes with respect to child welfare, social governance, ethnographical policies and charity awareness, adoption system, as means of social governance using social resources, should play a more prominent role. In the new context, the adoption legal system should be designed to encourage and promote adoption. A mechanism that values assessing and monitoring the entire process of adoption life rather than a simple review of the form and standards of adoption should be established. Looking ahead to future modifications of adoption law, the best interests of the minor adoptees should be the priority. This should replace the principle of favoring the upbringing of the minor as the fundamental principle underlying the China’s adoption legal system. This also corresponds with China’s commitments in the UN Convention on the Rights of the Child. Meanwhile, the law should reduce restrictions on adoption to reflect the recent developments in China’s population policies. Adoption is sometimes used to evade family planning policies. The previous guiding principle of family planning should be transformed into specific rules forbidding this kind of action. Properly lowering the thresholds for adoption is also an issue that could be revised in the future. With a dialectical comprehension of the relationship between family planning and adoption, the requirement that an adopter should be childless and may adopt one child only may be abolished. In addition, in terms of the requirement for adoptees, the article that specifies an adoptee should be illegally abandoned may also be amended. In this way, the legal barriers to adopting an infant or child rescued from child abduction can be removed. In regards to unlicensed adoption, multiple measures may be taken. On the basis of lowering the thresholds for adoption, adoptions that satisfy the legal requirements should be registered as soon as possible, including them into the domain of lawful adoption. In cases where non-government individuals and institutions are necessary, various forms of support and assistance may be provided to them. In this way, a connection between public welfare and non-government charity can be established. Within the scope of the nation’s fiscal capacity, China should enhance the quality and number of public welfare institutions and fulfill its duty of national guardianship, reducing the number of homeless children. A mechanism of tentative adoption and adoption monitoring should also be stated in future law. The primary goal of the adoption system is to establish a functional parent-child relationship through law, providing a good environment for the development of a minor. Whether this goal can be achieved in an individual case depends on the reconstruction and integration of the adoptive family, the unsuccessful process of which may result in domestic violence or abuse. For the best interests of the minor adoptees, professional assessments through an experimental adoption mechanism before formalizing the adoption relationship and routine follow-up visits and adoption monitoring should also be established. Deng Li is an associate research fellow from the Institute of Law at the Chinese Academy of Social Sciences.